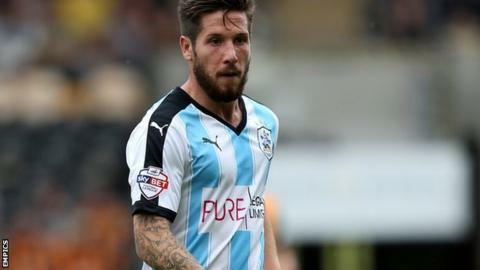 Huddersfield Town have rejected two bids from Derby County for midfielder Jacob Butterfield, chairman Dean Hoyle has confirmed. Hoyle told BBC Radio Leeds that the 25-year-old ex-Barnsley and Norwich man is not for sale. Butterfield joined Town from Middlesbrough in August 2014 and scored six goals in 46 games last season. Meanwhile, Hoyle has said keeper Alex Smithies, 25, is likely to complete his transfer to QPR for about £2m. "QPR came in very late on Friday. (Sporting director) Les Ferdinand rang me up and we negotiated hard to get an offer close to £2m," said Hoyle. "We think that for a goalkeeper who we have never had a bid for in the past and who is one of our top earners, it is a good deal. "If Alex's deal goes through, we need to make sure that we use the money to make us a better team." Town drew 1-1 against Brighton on Tuesday thanks to a Butterfield equaliser. Speaking after his side's 1-1 draw with Middlesbrough, Derby head coach Paul Clement refused to be drawn on his club's interest in the midfielder. He did, however, admit the club were actively seeking new recruits before the close of the transfer window. "We are working on one at the moment. We've highlighted a few, we haven't put all our eggs in one basket," said Clement. "I don't want to mention who those names are. I don't want to comment on that. That is between the clubs and it will remain private until we are in a position to announce a signing." Asked about the possibility of concluding a signing before Friday, Clement responded that it "will be difficult".